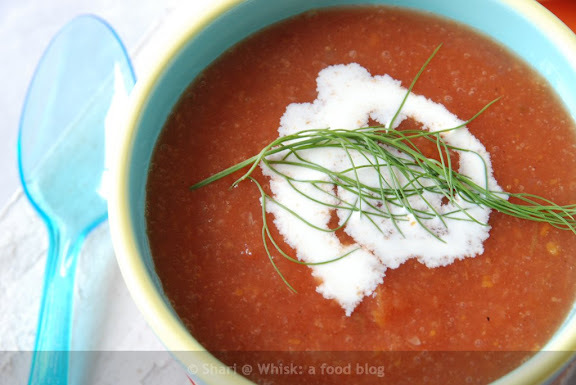 There are so many tomato soup recipes out there, but this is my favorite because every time I've made it for people, they have always requested the recipe. It's a crowd-pleaser, can be made ahead and is festive for the holiday season. It also contains a secret ingredient: allspice. Allspice is the dried fruit of the Pimenta dioica plant, but it has the flavors of some other spices: cinnamon, ginger, nutmeg and cloves. You can make this soup now, put it in canning jars, and freeze it. Once it's frozen, remove it from the jar and freeze in a freezer bag. This way you can use the canning jar for other uses. Serve with baked Parmesan Crisps, Cheddar Shortbread or Goldfish! You can serve the soup in antique tea cups at Christmas or shot glasses for a cocktail party. In a large, heavy stock pot, melt the butter. Add the onions, carrots, and garlic and cook for about 10 minutes. Then add the tomatoes, pesto or basil, sugar, salt and pepper. Cook for about 5 minutes. Add the stock and allspice. Bring to a boil, then partially cover, reduce heat and simmer for about 1 hour. Purée the soup in a blender. (You can freeze the soup at this point.) When ready to serve, add the cream and warm. Season and serve. 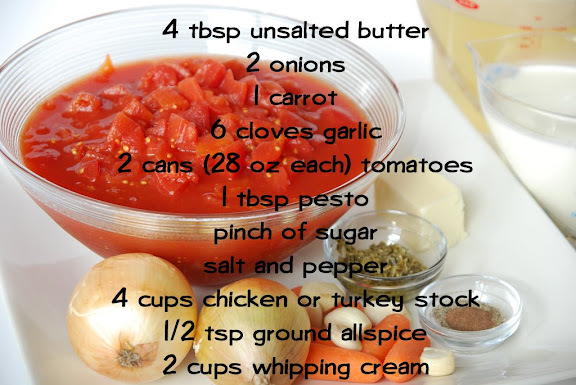 Tomato soup has to be one of my favorites...allspice must give it a nice little spice-I'll have to try this one I would not think to add allspice with tomatoes. This has a Christmasy look with the evergreen looking sprig on what looks like a patch of snow against the red backdrop. Gorgeous!I love the idea of freezing it and serving it in tea cups! A beautiful start to a meal in the Christmas season. Tomato soup with a grilled cheese sandwich is the perfect lunch! That looks so good. I just made some stock this weekend that I can use for this. Yum! I made tomato soup from about 40 pounds of tomatoes that were given to me once; Even with that amount it did not last long, as it was a family favorite. What a comforting soup. Always a classic! Thanks for another wonderful recipe Shari! Just in time for Christmas! Great idea about freezing in canning jars and transferring to bags later. Looks delicious! Hey! I just discovered your blog and I love it! I spent the last few hours (while at work - hee, hee) looking through the archives. I got a lot of inspiration from it. I can't wait to get home and get cooking. ps. I loved the mention of Saskatoon berries! I'm from SK myself! I am loving the new design. It's so bright and pretty! And really... tasty dough treats don't hurt either. veronica - The allspice gives it a really nice flavor. anonymous - It is a Christmas-y soup. Pair it with a cream of broccoli and you could have both colors of Christmas in one. pam - That does sound perfect! pinkstripes - Hope you make it! erik - Using fresh tomatoes would be even better. 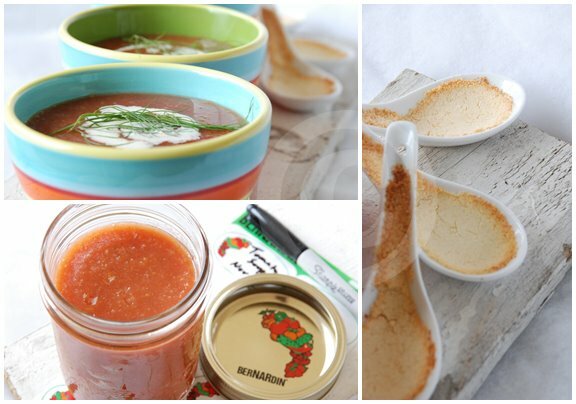 sharon - I've done this with many soups, and it works great! I defrost it in a microwave save bowl and it's ready in minutes. sarah - Thanks for the comment! I'm glad you found me and hope you visit often. Where in SK are you from and where are you now?? eb - Thanks to Jessica of Delicious Design Studios! !